I did this project before beginning the 30 Day Vegan Workshop in early March. 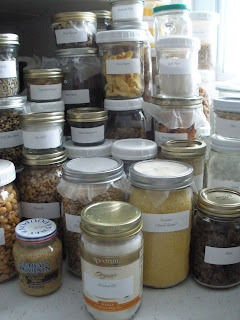 For me, it was a multi-hour project since not only did I get rid of items that wouldn’t be eaten or that had expired dates, but I transfered the healthy, remaining items into glass jars and labeled them. To read more about the process, click HERE. Day #9 – Organize your recipes! Make a three-ring binder for Favorite Family Recipes and another for Recipes to Try. You will need two binders, two divider sets with tabs, a three-hole punch, and a few clear vinyl sheet protector pages. Notebook #1. Favorite Family Recipes: Gather all of your recipe cards, recipes from magazines, and your favorite dog-eared recipes in cookbooks. On 8 1/2 x 11-inch paper, photocopy recipes you use frequently. Divide them into hors d’oeuvres, salads, entrees, and desserts. Place them in your notebook. This notebook will contain all those old favorites like Mom’s Apple Crisp and Uncle Charlie’s Chili. It will not contain untried recipes. filed in alphabetical order by category. With the recipes I want to try, I did like the idea of having a binder with top-loading protector sheets. So, using the same categories that are in my recipe boxes, I created sections within the binder. Then, I put top-loading sheets in each section and began filling them. I chose not to glue them onto paper or create “pages” because once I try a recipe, it either will be placed in one of the recipe boxes for making at a future time or it will go in the recycling bin and never be made again. Below/After: The finished binder filled with recipes I want to try. The recipes are divided into categories and placed in sheet protectors. In the fall, I went through the home and did a rather thorough purging of any knickknacks that weren’t enhancing the living space. There were a few that I found going through this time – ones that I had held onto for no reason in particular except that they “have always been there” – like the candleholder on the piano. Have I ever used the candleholder on the piano? Never. No sense in keeping it. Perhaps someone else could use it. Items that are leaving the home. Easter is next month, and each year I bring out a bin of decorations that I’ve been given, purchased, made, or kept because the girls made them. This year, I put them in charge of decorating which they loved doing. In the process, I saw the pieces that were important to them to have out and ones they bypassed and left in the bin. Some of the items (like the orange and purplse egg things with feet) they received as gifts (not from me), I received as part of different craft swaps, or we picked up at the secondhand shop. Since they didn’t see any value in them, there is no point in holding onto them. So…out they go. The area I picked is the upstairs hallway which doubles as a play area for the girls. At times, the cupboard ends up being a dropping-off place for things that need to go to various upstairs rooms or downstairs. As I looked inside the cupboard today, I realized that many of the items could be put elsewhere, thrown, or donated. It would make a logical place for linens or towels. I kept the quilted wall hanging on the wall because the walls would be too austere and not something I would want for the long-term. Having the storage chest and one item on the wall for the entire two-area hallway (I think) fits with the minimalism philosophy. The first step was removing all the items from the shelves and floor, and then placing it in grocery bags. I brought it to the family room so I would have a larger area to work in. As I went through the multiple bags of papers, I realized I must have kept almost every evaluation and progress report from the girls’ preschool and special education programs; a variety of artwork and homeschool work they did; magazine clippings that I wanted to reference in the future; children’s books; and items for scrapbooking which I never did or plan to do. The recycling container is almost filled! I kept one grocery bag that is about three-quarters full. I will work on filing it within the next week so that everything is placed where it should go. The nice thing: I have three open shelves now in the closet! It’s wonderful!! Day #13 – Edit Your Projects – Today, examine all of the projects you have not completed. To locate them, look into files, inside drawers, in closets, and under the bed. As they surface, make a list of things you promised yourself, or others, to do. Divide the list into Big Projects and Small Projects. See how many you can come up with in 30 minutes. I am going to focus on the bag of patterns that I put together while I was doing filing a couple of weeks ago. Some of the patterns were copies from books while others are actual pattern books. Since this a more time-consuming project and I need some quiet, uninterrupted time to do this, I am going to take this to the homeschool conference next month when I have three evenings with no responsibilities. Inspired to keep cleaning one of my office closets, I cleaned three more shelves today. I recycled all old brochures, catalogs, and educational information (e.g., activities for children in early education through 1st grade – which is younger than both my daughters). Grouped remaining items (e.g., notebooks all together, file folders together, envelopes together). This gives me a good idea also about what items I need or do not need as I prepare for the homeschool conference in a couple of weeks. Another bag out of the home! What ﻿a sense of accomplishment this week! It’s so nice to have some of these major projects that I’ve been wanting to do, but simply have not had (or made) the time to do them. Already, having the recipes organized has been better – I was able to find a recipe I needed quickly…and found several ones I could try this week using ingredients I have on hand. I’m doing the 30 Day Vegan workshop, and each week there is a weekly check-in. Thought I’d do this as a way to keep track of my progress during the workshop. I seem to have a bit more energy this week than last week. Having Daylight Savings Time on Sunday has been great. Instead of waking up between 3:30-4:00 a.m., now I’m waking up between 4:30-5:00 a.m. which is much better. I’m trying to get to bed by 9:30 or 10:00 p.m. at the latest. Although I may wake up a couple times during the night, it seems like I feel more well rested. Not noticing anything different with chewing or digestion. The only thing I was craving last week was hot chocolate. I ended up getting some powdered milk, powdered chocolate, and powdered sugar to create a homemade mix. So now I have my morning and (sometimes) nightly cups of cocoa which helps curb this craving. Although this isn’t a vegan beverage, it does have health benefits which are important considering I was diagnosed with macular degeneration last week. Here’s what I found about about hot chocolate: “Research completed in 2003 at Cornell University showed that hot chocolate contains more antioxidants per cup than red wine or tea and offers an even tastier way to get those high levels of antioxidants into your diet. “Research has proven that antioxidants can help prevent cancer, heart disease, and age-related macular degeneration. In order to obtain the same amount of antioxidants that you will find in a cup of hot chocolate, you would have to drink two to three cups of green tea, or two glasses of wine. Drinking hot chocolate is a healthier choice for you than eating a similar amount of chocolate because of its lower amount of saturated fats. After I washed my hair and let it air dry today, I noticed it was quite wavy. I don’t believe it has anything to do with eating healthier, but it was nice to see some natural curls in it. My skin continues to be clear. I’ve been doing the pinch test on my hand for dehydration during the past week since I’ve been trying to drink more water each day. It still takes a few seconds for the skin to return to its normal position after being held/pinched for three seconds. I think I may need to drink more water…perhaps I’m still a bit dehydrated and not realize it. Need to work more on my posture. My back isn’t as strong as it could be. Am coughing less this week than last week, and have not had to use my nebulizer (for asthma) which has been nice. On Wednesday, I had a rather discouraging and sad day after spending it with my parents helping them. My dad has Alzheimer’s Disease and had a particularly difficult morning. Spent four hours cleaning their home, cleaning the floors, and doing laundry. It’s hard to see my father’s health continue to decline, and my mom still have trouble with pneumonia. The weather has been getting warmer and the snow melting a lot. It’s been wonderful seeing grass again and not having to walk on ice and snow. This definitely was a mood lifter for the week. The other thing that sustained and inspired me one day – and continues to lift my spirits – was seeing an eagle perched on the oak tree that is right next to the driveway. The eagle sat in the tree for four hours. It was amazing seeing an eagle that close for such an extended period of time. Eagle in the oak tree by the driveway. Talked with other homeschooling moms a couple times this week – at the library as well as at the homeschool co-op that we use to belong to for several years. It was nice to talk with others face-to-face, and catch up on what was happening in their lives. I had a quesadilla with fresh salsa and chips for dinner one night. I had been eating cold dinners (e.g., green/tossed salads, pasta salad), so this was a welcome change. Last week, I chose my dad as the special person I appeciate. This week, it’s my mom. She provided a comforting and safe home growing up; delicious homemade meals; and created special family traditions that I’ve continued with my daughters. She has supported my father through his journey with Alzheimer’s Disease; and has tried keep the more challenging difficulties private. However, now she has reached a point where the challenges exceed what she can handle, and she is having to learn to accept help as life continues to change around her. 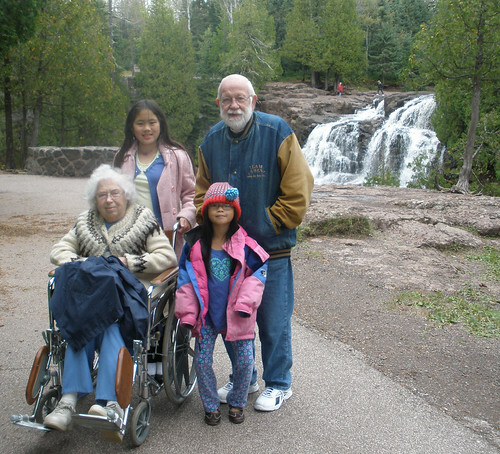 at Gooseberry Falls, Minnesota, in September 2010. I am also very grateful because she has offered to help me pay for a major kitchen appliance that needs replacing in appreciation for all the help I’ve given to her and my dad. As with last week, a lack of time to get everything done that I would like to do. This past week, Olivia had an appointment with an occupational therapist to assess her fine motor skills and sensory challenges; Sophia had her annual homeschooling testing; we visited/helped clean my parents home; and we continued taking care of the neighbor’s dog three times each day. Each of these things took a major portion out of the morning/day, leaving less time for homeschooling, preparing 21 meals from scratch (no instant food! ), taking care of the animals (domestic and horses), and household cleaning. Getting caught up with filing and getting all receipts/paperwork together for taxes as part of the Project Simplify challenge was a huge mood-lifter! It was definitely a way to take care of and focus on myself. More about the project and what I did is HERE. The girls and I filled the bird feeders and made squirrel buffets. Within 5-10 minutes, the birds had found all the feeders and were flying all over the front- and backyards. The squirrels found the feeders and would run and pick something from them and then run back to the woods or under a tree to eat the item they chose. Watching the birds and squirrels gives me a lot of enjoyment. Start bicycling again as soon as it is a bit warmer. I’ve enjoyed trying a variety of vegan and vegetarian recipes this week – either provided by the 30 Day Vegan Workshop or ones that I’ve collected through the years and have wanted to try. For the most part, they’ve been delicious. Other times, no one has liked them. That’s frustrating because then I’m looking at wasting food which I don’t like to do. Luckily, there were only three recipes – out of the many I tried this past week – that didn’t turn out. Still, I would rather try new things and experiment in the kitchen. It’s always nice to find new recipes that everyone loves and can’t wait to have me make again! During the upcoming week, I am going to continue trying new recipes. There were quite a few provided this week as part of the 30 Day Vegan Workshop that look very good. I’m also working on a couple of simplifying projects: Project Simplify. Also plan to do the 30 Days to Simplify Your Life that is HERE. I still need to get my taxes to my accountant; get recommended vitamins for macular degeneration; and start growing some vegetable and herb seeds indoors. For homeschooling, I want to put together a weekly schedule of what I want each of the girls to accomplish. In this way, they can mark off what they finish, and can start working to complete some subjects for the school year. I have many more goals for the week that I write in my calendar. When I’ve completed the task, then I highlight it. Many years ago, when I worked at Aveda, that was one of the recommended ideas for goal setting/achievement: highlight what you’ve accomplished. In that way, when you look at your list it is colorful and shows all the things you’ve done. It’s more motivating (for some reason) than simply crossing off an item from a to-do list. I’m tired, but I think that’s from not getting full nights of sleep and from being pulled in too many directions (caregiving, homeschooling, and parenting) as well as some stressful events that happened this week. Ran out of hot chocolate which I miss. The variety of salads and fresh vegetables is crowding out the need for less healthy food. I have clear skin this week which is nice. Also started putting on Watkins night cream and Watkins Rejuvenating Foot Cream (the peppermint kind). What a difference! My skin is super soft now. I think the creams combined with the fact that I’m drinking more water is making an impact. This week, I’m going to fill one of the glass pitchers with water and add some slices of limes, lemons, and oranges in the refrigerator. Not noticing a difference. However, when I cleaned out my closet, I did donate some clothes that were too big for me and were essentially shapeless pieces of fabric that were meant to hide one’s body. Figure there’s no point in keeping clothes that don’t make me feel good about myself. Have been having lots of problems with breathing due to asthma going into the week. Got new tubing and a mouth piece/medicine holder for my nebulizer. Have done several treatments and my breathing seems to be a bit better now. I am still coughing on and off. My sister took my mom to the doctor yesterday, and she has pneumonia. My dad is still coughing, and I’m going to take him to the doctor on Wednesday when I see him next. Am hoping that I don’t have the same thing they do since I was around my dad earlier in the month when he was coughing…though I did get a pneumonia shot this fall when I got my flu shot. By mid-week, I was feeling good about cleaning my closet, trying new recipes, and “re-claiming” my life. On Wednesday, I called 911 for my mom who had fallen. Based on what my dad was describing, I thought she was dying. Waited for 25 minutes from a call back from 911. They got her back up and into bed. Good news on Wednesday was that Olivia’s opthamologist said her near-sightedness has improved slightly. She also doesn’t have to go back to the daily patching program or eye medicine to prevent her lashes from scratching her cornea. On Thursday, Sophia and I went to the optometrist. I found out I have the beginning stages of macular degeneration (the dry kind) and Sophia can only see 20″ in front of her face. A major growth spurt radically changed her vision within the past year. The optometrist said that her eyes most likely will get worse throughout the remainder of her growing years. Sophia’s vision is correctable by glasses which is good. For me, thankfully, this type of macular degeneration progresses slowly so I will have time to getting use to a gradual decrease of vision loss until only the peripheral vision is left. So my mood and emotions this week…up and down…at best. Stressful…to say the least. I’m friendly to people at appointments and in public (that’s the same as usual, though). I did a bit of catching up with emails and correspondence. As for going out some place with friends and having fun…I don’t remember the last time I did that. That’s something that I’d like to do. Maybe once the weather gets warmer it will be easier to get together with friends. I hope so. Some days can feel rather isolating and overwhelming in ways. For breakfast, the most nourishing food I ate this week was an English muffin with super chunky honey peanut butter. Also made a smoothie another day that had three types of fruit, dairy-free yogurt, and orange juice. Very good! For lunch, I made a pasta salad with mandarin oranges, toasted sesame seeds, and peanuts. The homemade dressing for the salad was delicious and adds a lot of flavor to the salad the longer it is refrigerated. For dinner, the girls and I made homemade pizza – including the crust. Mine had pizza sauce with Italian seasoning that I added, mushrooms (without salt), sun-dried tomatoes, green peppers, and onions. We may do another pizza dinner soon. My dad is the special person I appreciate. 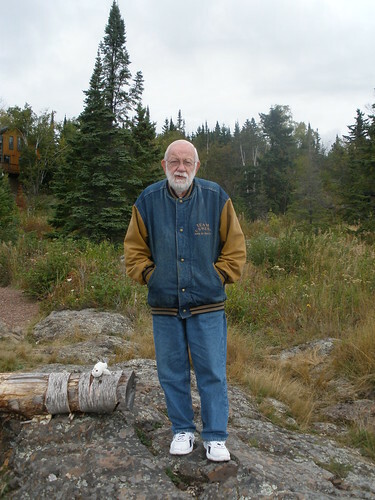 Although he has Alzheimer’s Disease, he handles his losses with grace. He tries to the best of his ability. His love for nature, birds, writing, reading, and spirituality are all important things in my own life. His influence – and impact – are reflected daily in me. Lack of time to get everything done that I would like to do. It seems like there are so many things on my “to do” list, but not enough time in the day. I do the most important – and critical – things and hope to eventually get to the things that are either equally important and/or things I simply would love to do. Cleaning my closet as part of the Project Simplify challenge was a huge mood-lifter! It was definitely a way to take care of and focus on myself. More about the project and what I did is HERE. On Wednesday, Sophia, Olivia, and I went to Goodwill and River Market Co-op. I found several beautiful 100% cashmere sweaters at Goodwill that I can use in crafting. I’ve already felted them and am thinking about what to create from them. At the co-op, the girls picked out some snack food they wanted and I got the ingredients for making some natural bath and homecare products. Start eating healthy again and continue to simplify my home/life. It seems like I’m in a reactionary state right now – especially given so many factors I can’t control. I need to find some areas that I can control (in a healthy way). I re-focused the goal of the 30-Day Vegan workshop to 30-Day Vegetarian/Vegan workshop because that’s a more realistic and long-term goal for me. I’ve already had to make some major long-term modifications to the way I cook given Sophia’s dairy allergy. Having a blend of vegetarian and vegan meals each week is attainable and something that the girls and I have easily transitioned to this week. It’s nice to see how excited they are about eating some of the new healthy recipes and food. I had a bouquet of flowers that I divided up into different smaller vases this week. We’ve been putting them around the house in different spots which has been nice. Having fresh flowers – the colors and scent – has been such an uplifting thing to look at. During the upcoming week, I want to try more recipes and use the menu for the week that I planned on Saturday. I’m also going to tackle another area for Project Simplify. Also plan to do the 30 Days to Simplify Your Life that is HERE. Also want to get my taxes to my accountant; get recommended vitamins and prescription sunglasses for macular degeneration; and start growing some vegetable and herb seeds indoors. I’d like to have a larger vegetable, fruit, and herb garden this year so we can eat more produce this summer as well as can/preserve it for winter use. Most important: take time to create something new. This past week, I made two new window stars that are hanging in my bedroom. Every time I look up and see the pretty colors…and then look over to the base with the pink and lavender flowers…it helps brighten my mood. I made this for dinner yesterday (along with the dilled cabbage slaw and a slice of bread). The dressing portion of the recipe called for the juice of two lemons, olive oil, and sea salt. The lemons produced about one cup of lemon juice which was a bit too much for the amount of quinoa, variety of vegetables (cucumber, red onion, scallions, and cherry tomatoes), and mint. However, when we had some for lunch today, the majority of the dressing had been absorbed into the quinoa so it wasn’t as “soupy” looking as it looks in the picture. I think the juice of one lemon would have been sufficient (that’s how I’ll make it the next time I prepare this recipe). The mint definitely added a nice flavor to the tabouli. Made homemade granola (oats and coconut) flavored with maple syrup, vanilla, and coconut oil. Baked it in the oven for 40 minutes and as it was cooling down, both the girls wanted to sample it. “It smells so good!” Sophia said. They enjoyed tasting the maple syrup in the granola. It’s been interesting to see how the girls are open to changing the type of food they eat. Sophia asked if she could pick out more Brussels sprouts at the store on Thursday. “Absolutely!” I told her. Olivia (who is 8 years old) started fixing herself lunch today while I stepped outside briefly. The first thing she picked from the refrigerator: organic strawberries from the co-op that she sampled on Wednesday. “The strawberries are delicious!” she said. Now that’s what I like to hear!! Outside my window…it’s still dark outside, but the trees are now visible against the snow. I am thinking…I’m going to wait until Wednesday to begin the 30 Day Vegan Workshop. It makes more sense to begin that day for me since I want to include a lesson about Shrove Tuesday/Mardi Gras today with the girls and make some food that ties into the day. From the learning rooms…I’ll be concentrating on doing science lessons with Sophia and Olivia this morning. Also will be reading aloud part of The Landmark History of the American People to Sophia. She’ll be reading aloud Om-kas-toe (a story from the Blackfeet tribe). Olivia will be finishing her unit study on Aesop’s Fables. We’ll be learning about Mardi Gras and Shrove Tuesday today. I am wearing…a long-sleeve t-shirt, short-sleeve t-shirt, pajama pants, and warm socks. It’s still morning…only 6:16 a.m. I am creating…a yellow window star for a customer so I can mail it to her today. 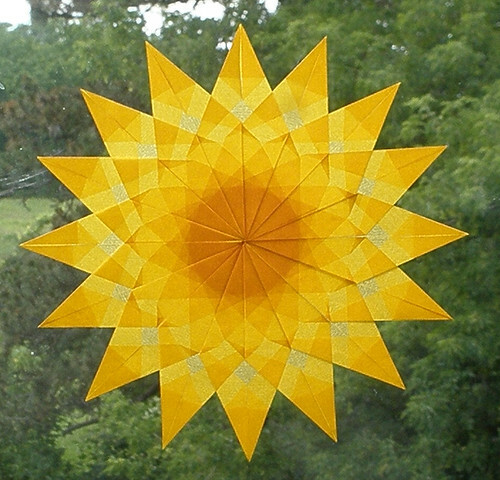 This is the yellow window star that I’ll be making. I am going…to hopefully use some gift cards to purchase a new dishwasher this week. After doing dishes by hand for well over a month, it’s time for a new dishwasher. Since I’m cooking three meals a day from scratch, there are a lot of dishes each day. My time can be better spent doing other things that are more meaningful and have a greater impact. I am reading…several books are “next in line” on my bookshelf: Backyard Bird Secrets for Every Season – Attract a Variety of Nesting, Feding, and Singing Birds Year-Round by Sally Roth; Parched by Heather King; and Home Safe Home – Proecting Yourself and Your Family from Everday Toxics and Harmful Household Products by Debra Lynn Dadd. I am hoping…that today is a better day for my parents who have had some rather challenging days recently due to my dad having Alzheimer’s Disease and my mom caring for him at home. I am hearing…some new bird chips and calls. I think some of the migrating birds are coming back now! A sure sign of spring!! Around the house…are projects that need to be done (as in repairs)…and projects that I would enjoy doing (sewing, embroidery, and cross-stitching). One of my favorite things…the land that this home is on. I love seeing all the birds and wildlife that have made it their permanent or temporary home. A few plans for the rest of the week: organize my closet as part of the five-week Project Simplify challenge; take Olivia to the opthamologist for her quarterly appointment; go to the optometrist (for Sophia and me); and take out the bikes after the last snowfall melts this week so we can begin biking since the roads are now free from ice and snow. Here is picture for thought I am sharing…about a year ago at this time, there was no snow on the ground and the girls were wearing short sleeves outside. Here they are taking Eenie for a walk around the backyard. He was a good sport about wearing a collar and being led around by a leash. I think he was just excited to be out and exploring. Are you a blogger? 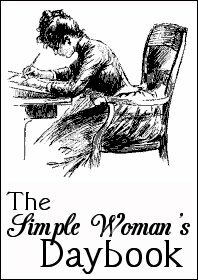 Go on over to the Simple Woman’s Daybook and join the blogging and read what others are doing!